A while back, I posted about my discovery (new to me, though not new to many others) that the serials crisis should probably be called something like the “scholarly journals crisis”. The term “serials” includes a wide range of publications, most of which are not peer-reviewed scholarly journals — newspapers, goverment reports issued in series, yearbooks, magazines and more. Only about 1/10 of the serials in Ulrich’s directory are peer-reviewed. 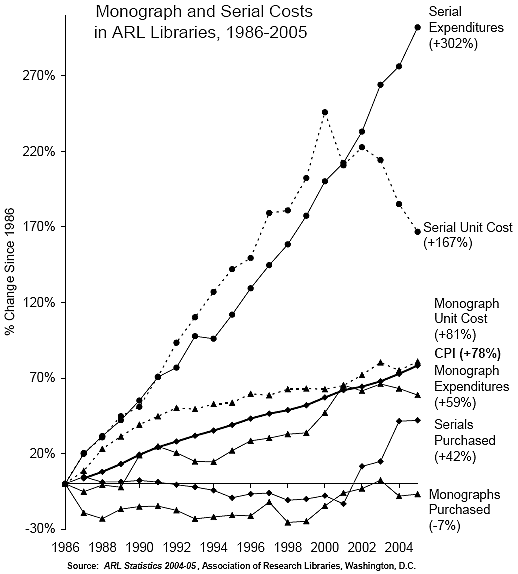 The average scholarly journal costs around 10 times as much as the average serial, and while the cost of the scholarly literature continues to climb, median serial unit costs at ARL libraries have actually been falling for the last seven or eight years (Fig 1 below). It therefore appears that scholarly journals are the driving force behind the serials crisis. At the time, I wished that I had some specific data to show the difference between scholarly and average serials — hence the title of this post: via medinfo, I learned that EBSCO Information Services has released a brief report (pdf!) on the price history of well regarded clinical journals, using 117 titles from the NLM’s Abridged Index Medicus (AIM). This is a curated list of biomed journals “of immediate interest to the practicing physician” and can be searched on PubMed as a subset limit named “core clinical journals”. This is exactly what I wished for, hard evidence of the difference between scholarly and average serials; and what that evidence strongly indicates is that price increases in scholarly journals are driving the serials crisis. Scholarly journals far outstrip total serials in terms of annual price increase, even though the latter shows a much more rapid increase than the CPI. In contrast, library salary expenditure follows the CPI closely, and median serial unit cost (all serials) has been dropping slowly since 2000. Frankly, I’m tempted to name this the Big Fat Ripoff Graph. Between 1990 and 2008, the CPI increased by about 65%, whereas over the same period the average price of an AIM journal increased by 415%, a 6.4-fold difference. I’ve seen publishers try to defend the “total serials expenditures” vs CPI discrepancy by pointing out that journals are proliferating — indeed, the “serials purchased” curve is headed upwards at an increasing rate, particularly over the last five years or so. 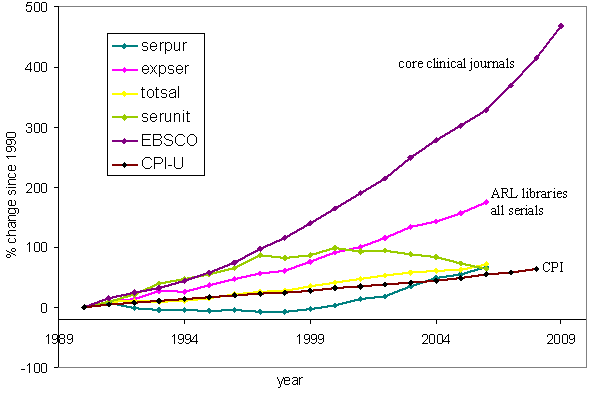 But that defense is no good against the BFR Graph, on which the most damning curve shows average journal prices. I’ve also seen comments to the effect that if mean or median serial unit costs are dropping, publishers must be offering increasing value for money even if they are charging more in total. That might be true of the set of “all serials publishers”, but it’s apparent from the BFR Graph that scholarly journal publishers can make no such claim. It must be remembered, of course, that we are only looking at a little over a hundred clinical journals here, a small and discipline specific subset. Nonetheless, the result is so striking that I think it is a considerable inducement to the gathering of more data. Since it seems my wishes for more work are coming true, I’ll make another: now I want price history data for other, larger journal subsets in other scholarly disciplines. I wonder what the BFR Graph looks like for those datasets? Update: ha! I just got around to reading this article, linked by Peter Suber a couple of days ago; turns out it’s full of annual price data, and Van Orsdel and Born have been doing these surveys for at least ten years. There doesn’t seem to be a central collection or data collation, so I’ll have to piece it together. Stay tuned!